So the old Expanded Universe (now referred to as Legends) was split up into different literary eras. A brief summary of those eras would be Pre-Republic (5000-67 BBY), Rise of the Empire (67-0 BBY), Rebellion (0-5 ABY, New Republic (5 – 25 ABY), New Jedi Order (25-40 ABY) and Legacy (40+ ABY). The Legacy Era mainly comprises of Legacy of the Force and the Fate of the Jedi books, along with the Legacy Comic Series. This comic series dealt with the rise of the One Sith, a new Sith Order led by Darth Krayt. One of the major Characters (and villain) featured in the Legacy Comics was that of Darth Talon. Talon is known for her striking appearance, a rare red skinned Twi’lek covered in ritual Sith tattoos and is a loyal and trusted ally of Darth Krayt. If you would like to read more about Talon, the Wookieepedia link on her is here. But how did Talon get to be considered to become a villain in Star Wars Episode VII: The Force Awakens? So to those who don’t have the LucasFilm book: The Art of the Force Awakens, the book is more than just art of the film. While it does cover concept art for made it into the film, it also covers scrapped concepts, the evolution of designs that lead to characters, locations and vehicles that appeared throughout the film, and the genesis of ideas that began during very early production. The Force Awakens was always going to feature a “big bad baddie” in the shadows, similar to the Snoke like figure we were introduced to in Episode VII. During the early production of The Force Awakens, this shadowy figure was at one point known as Uber. But there was also to be a more physical and more real antagonist to be featured, which as production went on this Character became the Kylo Ren that we know. Though during early production this Character was known as the Jedi Killer and even as Darth Talon. Now while there’s not much to go one as there’s only this picture, of Talon and Uber with a short description that mentions the simplicity of Talon’s tattoos and that she’s being puppeteered by a Darkside User. This concept would later be used for Snoke and Kylo, which is even commented on in the film by Han Solo. There is also two other images involving Talon. 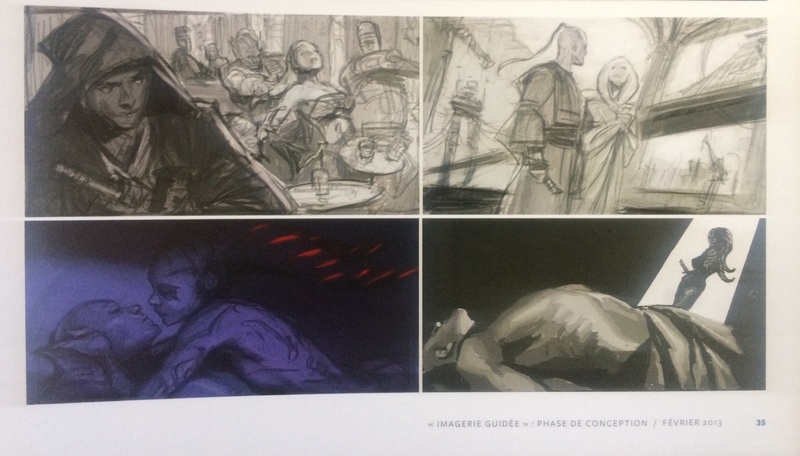 Which can be described as early concept art, the first one being Talon in some sort have bar. Which if you closely you can also see a figure that looks quite a lot like the Bounty Hunter known as Dengar. The second image, comes off more like a short storyboard. Which shows a Jedi saving her from some sort have attack, which she when repays by seducing and then killing him. The idea of the Jedi Killer was morphed pretty seamlessly into Kylo Ren, basically the Jedi Killer was the son of the Solos and would have killed his father, Han Solo. However as Pablo Hidalgo explains in a now deleted tweet, the idea for Talon was that she would have corrupted Han’s son, turning him to the Dark Side. Please note though this was fairly early on in the Production of Episode VII. Well that’s because George Lucas would have also ignored the Post Endor EU too, telling a different Post Endor story than that of Legends. The author of the Art of the Force Awakens and LucasFilm’s Creative Art Manager Phil Szostak stated pretty clearly that it was the design and the look of Talon rather than the lore of the Character that was admired and which would have been used for the film during early Production. 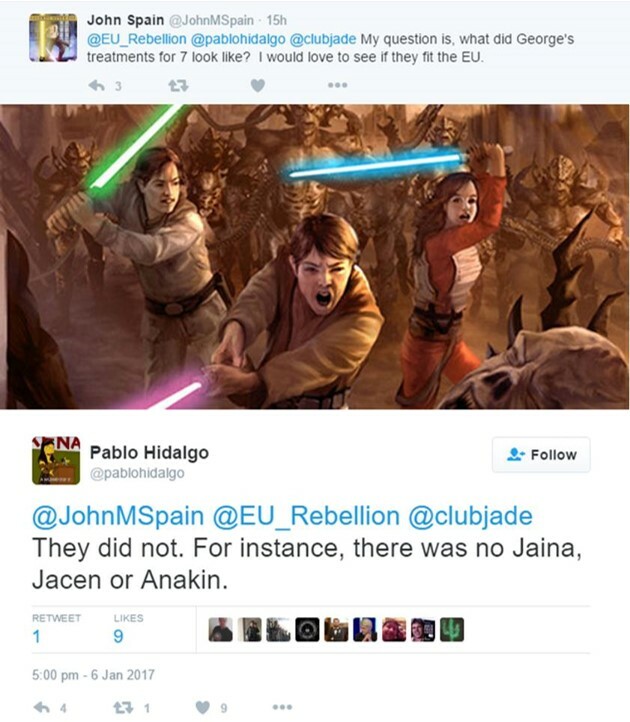 Since the Solo son has been brought up quite a bit in the article, it should also be mentioned that according to Pablo Hidalgo the treatments that George Lucas had done for Episode VII would not have included Han & Leia’s children from Legends, that’s twins Jaina & Jacen and their younger brother Anakin Solo. Think how many stories that took place in the Expanded Universe that would have been effected by not having the births of Jaina, Jacen and Anakin Solo and the death of Han. Many, many Post Endor books and comics would have had to be retconned anyway. 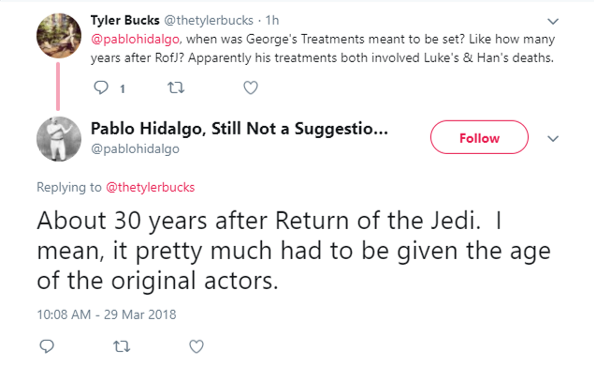 I should also mention that in George’s treatment’s for Episode IX, Luke was to die. Just like LucasFilm now, George wasn’t going to be bound by the Expanded Universe for future films. But what are your thoughts on this? 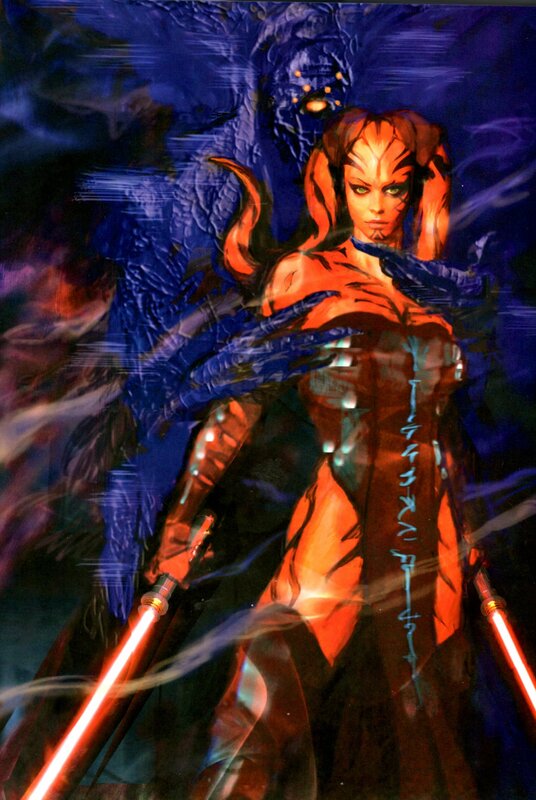 Would you have liked to have seen Darth Talon appear in Episode VII and come to the big screen or was it for the best to leave her in Legends?